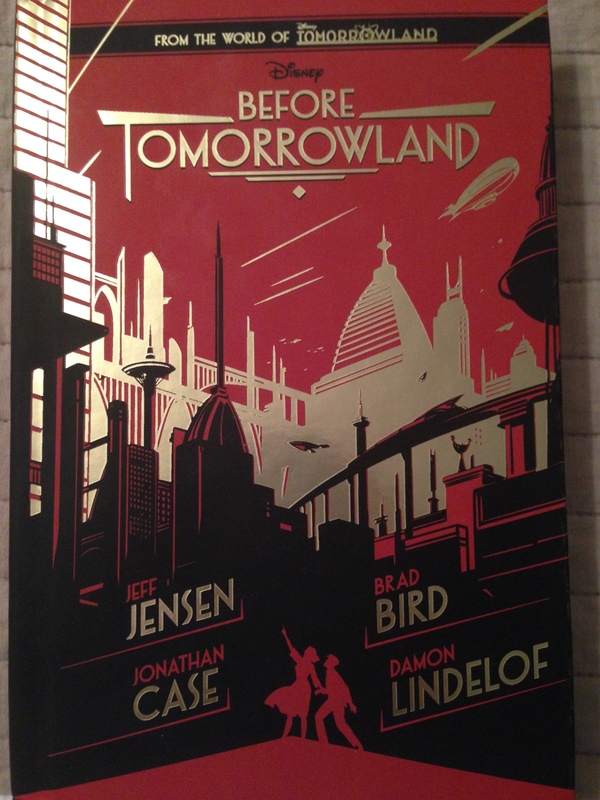 Before Tomorrowland is a bit of a difficult book to categorize, not that categories are necessarily important. It’s technically a prequel to the Disney film Tomorrowland, in theaters this weekend, but it features none of the characters from the new movie. It almost requires a familiarity with at least the premise if not the trailers for the film or even the Alternate Reality Game “The Optimist”, and the imagery that we’ve seen thus far continually floated through my mind as I read the book. It tells an interesting story on its own, but even more it serves as a palate whetter for the film, offering just enough backstory and explanation while still leaving the right amount of mystery and curiosity to energize my interest in the film (already at an all-time high, as Tomorrowland is my most anticipated film of the year, even ahead of Star Wars). The result is a novel that’s almost impossible to objectively view on its own, yet which is perfectly placed to capitalize on this exact moment, although I imagine that only the most die-hard fans will have sought it out. Yet it’s also a fun, exciting, fascinating story in its own right, with an interesting twist on some familiar faces from history as well as an intriguing look at what might have been and what we someday might accomplish together. Before Tomorrowland is set in and around the 1939 New York World’s Fair, near the end of the Great Depression, the beginning of World War II, and just a couple of days before Lou Gehrig’s famous retirement speech. The story follows Clara Brackett and her teenaged son Lee. Clara has journeyed to the World’s Fair to take part in Worldcon, the first ever science-fiction convention, where she plans to show off her futuristic, utopian artwork in the hopes of landing a deal doing drawings for comic books. Lee, however, is more interested in baseball than sci-fi, but he accompanies his mother in order to watch after her as she battles a brain tumor. She constantly forges ahead, filled with enthusiasm, optimism, and fearlessness, while he hangs back cautiously, skeptically, and constantly worried about the future. Their lives are forever changed, however, when Lee is handed an odd comic book from a mysterious vendor at Worldcon, which includes a pair of 3-D glasses that work not on the book but on the world around them, but only for Clara. The book, the glasses, and Clara’s determination lead them into the world of Plus Ultra, a secret society where scientists with names like Einstein and Tesla, visionaries with names like Wells, Disney, or Hughes, and even individual heroes with names like Earhart, have joined together in order to help shape and drive the world’s progress. Plus Ultra is on the verge of changing world for good by revealing the existence of another universe of limitless possibilities and hope, but the arrival of a Nazi U-boat, a Plus Ultra defector, and the sins of Plus Ultra’s past in the form of Frankenstein’s monster-esque creation all converge to not only threaten Plus Ultra’s immediate plans but the organization’s entire existence. It’s a race against time to unravel their enemies’ plans, dodge attacks from a wild card, and save their dreams, with the poor, humble Bracketts caught in the middle. Before Tomorrowland moves along at a brisk pace, and it’s crammed with characters, ideas, twists, theories, classic science fiction tropes, and world building. At times it feels like there’s almost too much going on, and characters and plotlines occasionally get lost in the shuffle, though they all generally work themselves out by the end. The book has four credited authors, with Jeff “Doc” Jensen and Jonathan Case with a “written by” credit with a story by Damon Lindelof, Brad Bird, and Jensen, and occasionally it shows. In many ways the book is a testament to the world they created for the film, which is vast, intricate and well thought out, but the narrative sometimes struggles to keep up. The Bracketts are the most compelling aspect of the story. Their evolving relationship is at the heart of book, and the way the authors capture their divergent attitudes both towards the fantastical events they witness and the more grounded reality of Clara’s fatal diagnosis is charmingly authentic. In a world full of larger-than-life characters and historical figures, the Bracketts are the ones who stand out. But in the end, Before Tomorrowland left me frustrated. That’s not a reflection on the book itself, or its writing, but more on the oddity of its existence. There are so many intriguing ideas and complex philosophical issues at work in and behind the story that I often wished I could just sit down with the authors over a cup of coffee and pick their brains about what they were trying to say. No real conclusions are drawn about the books greater concepts such as the purity of science, the corrupting influence of money, the necessary evils we accept in order to do good, the limits that are placed or should be placed on progress, and whether there’s really any hope for humanity, but I imagine that’s partly by design. This is, after all, just the beginning (well, technically the middle) of the story, a story which will be continued on the big screen in just a few days, and I expect some more definitive statements once the film is over. I frequently wished the book’s action would pause for a few chapters just to allow the characters to stop and have an intense debate about the issues they’re facing, which to me is the sign of an interesting novel. When your characters have strong voices and complex problems to deal with, who cares whether the action is exciting or the twists are surprising? Of course, if the action is exciting and the twists are surprising, so much the better. This entry was posted in Books and tagged before tomorrowland, book, Book Review, Books, brad bird, damon lindelof, Disney, jeff jensen, jonathan case, Tomorrowland by lovepirate77. Bookmark the permalink.